Indipendent apartments recently built and well finished and accessed 600 meters from the beach, sleeps 6,7 people cadaum being with 2 bedrooms and 2 bathrooms and 1 suite, living room, kitchen, laundry and leisure area with barbecue. It offers wifi, air conditioning, solar heating, spaces for leisure area with barbecue cars, electric fence and electric gate and. Well near, walk to any shops, supermarkets, pharmacy, bus stop, gasoline point, bars, gym, ballads. Best place for its quietness and diversao. Two bathrooms with shower and finish first and acessoriado. All beds have a coralline cover antiallergic and waterproof. Otima localizacao, anfitriã muito gente fina e super honesta, e simpatica, super recomendo!! Agradeco vc pelo seu carinho e cuidado na minha casa, volte sempre!!! apartamento execelente! 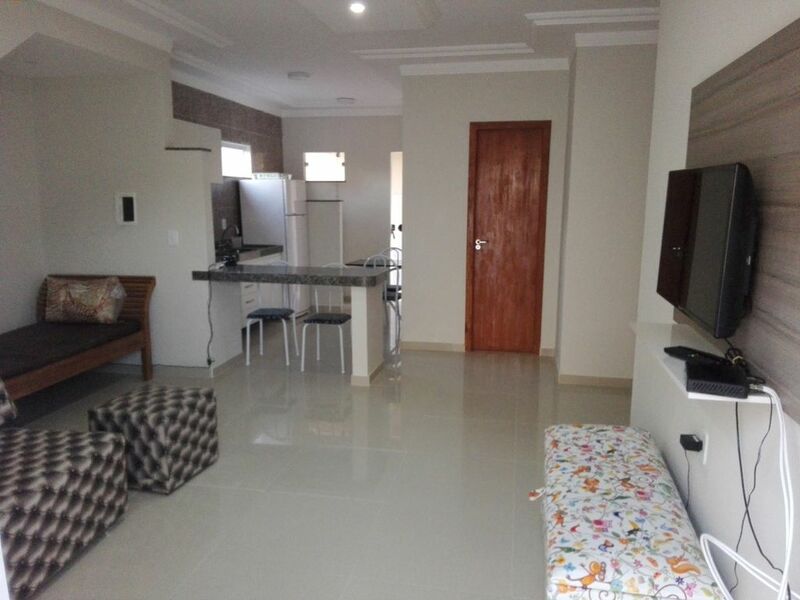 otima acomodações e localização, predio novo. Agradeco a sua atencao e cuidado na minha casa, volte sempre!!! Obrigada pelo carinho e cuidado desta familia. Agradeco esta familia atenciosa e muito tranquila, seja sempre bem vindo! Estou muito feliz de ter hospedado este casal maravilhoso e super simpatico que tive muito cuidado e respeito pela minha casa. Espero de ter a honra de hospedar vcs de novo. My property is right near the Arena Axe Moi, unforgettable concerts at night and during the day entertainment on the beach. 200 meters of the best restaurants and parties. Visit the center of Red Crown with the market for Indios and white beaches with clear water with corals like being in the pool ..
Visit the discovery point of Brazil and the historical city and the famous Alcol the walkway in the city center. famous tourist spot is Arrajal d'Ajuda and quiet and chic with beaches suitable for all sports. Guaranteed fun and relaxation at the same time.